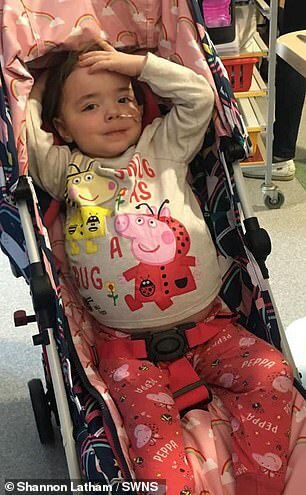 A toddler is battling a rare and aggressive cancer that has left her ‘looking pregnant’. 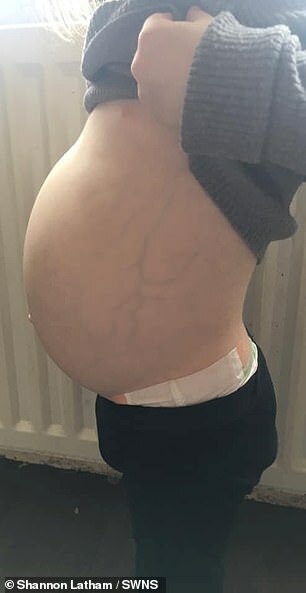 Cleo Keenan, of Blackpool, suddenly developed an abnormal swelling in her midriff earlier this year, which doctors put down to a hormone imbalance she has suffered from before. 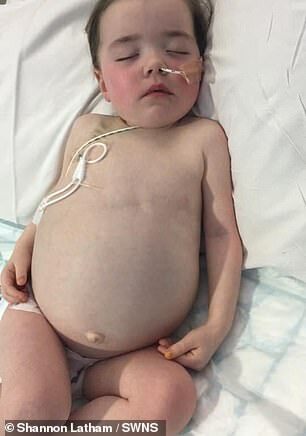 It was not until she endured severe abdominal pain that a CT scan revealed the two-year-old is suffering from stage three adrenal carcinoma, which affects the outer layer of the adrenal glands. Following her April 1 diagnosis, Cleo started chemotherapy and blood transfusions. And she requires more treatment to shrink the tumour before surgery to remove it. 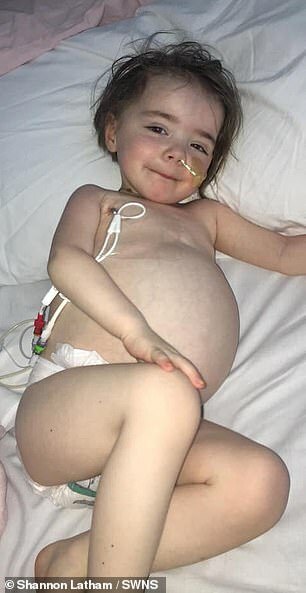 However, her parents Shannon Latham, 23, and Ryan Keenan, 26, have been told their ‘little warrior’ has just a 25-to-35 per cent chance of surviving, with the tumour returning in 80 per cent of cases. Cleo was taken to a medical centre in February, where doctors initially dismissed her symptoms as being nothing new. ‘Because of her hormone changes, they thought she had a hormone imbalance,’ Ms Latham said. Cleo was then rushed to Blackpool Victoria Hospital’s A&E department last month with a severe stomach ache. The youngster was given a CT scan, which revealed the huge tumour inside her abdomen. She was taken to Manchester Children’s Hospital the next day for further tests. Two weeks later, she received the devastating diagnosis. ‘It was such a shock when we found out,’ Ms Latham said. ‘It’s just begun to sink in because she’s so young and she’s such a bright child. Cleo required urgent treatment, which began the day after she was diagnosed. 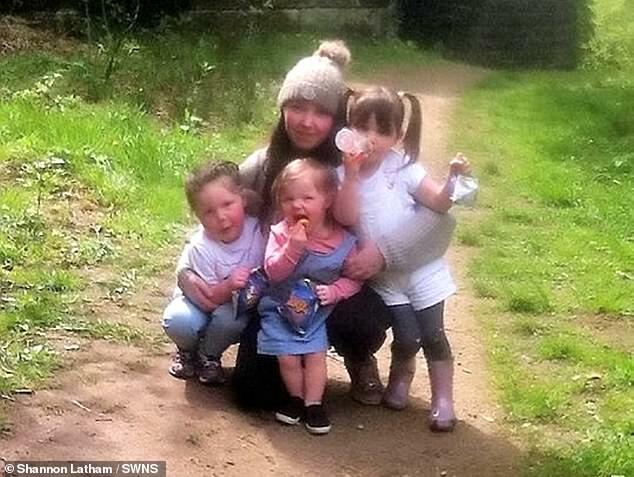 Ms Latham – who is also mother to Emelia, five, and Ellie-Mae, four – said: ‘On April 2 she started chemotherapy and she was on that for four days. It was draining. ‘She’s gone from being a normal happy child to a really poorly little thing and it’s really difficult to see. ‘I’m sat there every day with her just watching her go down and down. Cleo is due to undergo further chemotherapy before an operation to remove the tumour and her affected adrenal gland later this year. However, her mother claims there is an 80 per cent chance the tumour will return even after surgery. Adrenal carcinoma is a ‘very rare’ cancer that starts in the outer layer of the adrenal glands. The adrenal glands produce hormones and are located above the kidneys. Adrenal carcinoma can cause too many of these hormones to be made, leading to symptoms. For example, too much cortisol can affect the body’s blood sugar balance. And excessive amounts of aldosterone can upset water and salt levels, as well as blood pressure. Adrenal carcinoma’s cause is often unclear. Some people are born with a genetic mutation that puts them at risk. Treatment depends on the size of the tumour and whether it has spread. Adrenal carcinoma is often fast growing and only diagnosed at a late stage, which makes treatment tricky. It can include, however, surgery to remove the affected gland, as well as radiotherapy and chemo. ‘All we can do is remain positive and happy,’ Ms Latham said. ‘It keeps a smile on Cleo’s face. That’s what we want for the whole time she’s being treated; for her to keep smiling. ‘We just say to ourselves this is just another chapter of her life. ‘We are shrinking the tumour with chemotherapy at the moment and once it’s small enough they’re going to remove it. 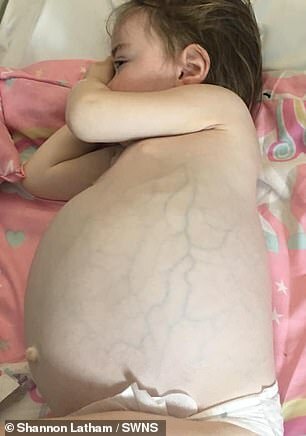 Writing on her fundraising page, Ms Latham claims her daughter’s tumour is ‘the size of a grapefruit’ and is ‘causing her intestines to be squashed to the left side’. 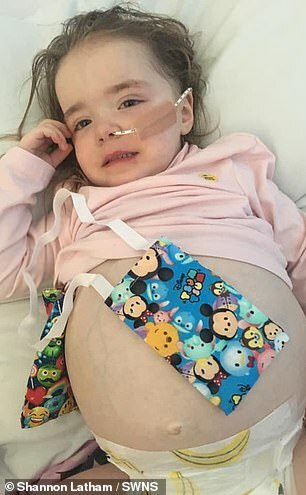 She claims Cleo’s heart rate has gone up as a result of the growth, which also leaves her feeling ‘full all the time’ and ‘peeing constantly’ because it presses on her bladder. But despite everything she has endured, the youngster manages to stay positive. ‘Cleo is still smiling through every single day,’ Ms Latham said. ‘She still laughs and jokes, and the hospital has been amazing – she’s been having fun in their playroom. She’s a little warrior. ‘When I see her smiling when I’m with her it makes everything much easier. ‘Cleo is bubbly and independent. She’s really advanced for her age. She’s not like other two-year-olds. Her speech is amazing. She speaks like a four or five-year-old. Ms Latham credits her partner for helping her get through this difficult time. The family has set up a Facebook page – Cleo’s Chapter – to document the toddler’s cancer fight. They have also launched an online fundraiser to help pay for their regular journeys between Blackpool and Manchester Children’s Hospital, where Cleo is being treated.